I’ve tried to force my way into his mouth, but this ends with him screaming and me crying out of utter frustration. This is a big problem. I was concerned that his teeth were going to rot out of his head the way he “brushes” them, so I made him a pediatric dentist appointment, which Wil took him to today. 1. 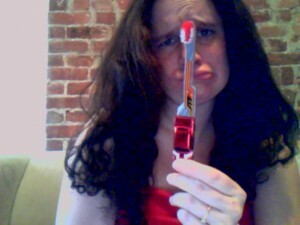 Get a smaller toothbrush. Yeah, his toothbrush is pretty damn small. 2. Brush them while he’s in the bathtub. What a great idea, if only he’d let me brush them! 3. Get a tastier flavored toothpaste. Right…so he can eat the entire tube! Do your kids brush their teeth without a fight? What should I do to get this kid to brush his teeth?! 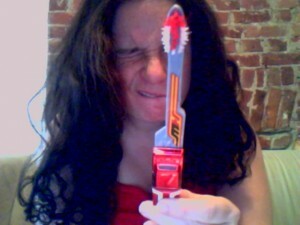 By Sarah Fader| 2014-04-06T01:57:05+00:00	January 17th, 2011|Uncategorized|Comments Off on Brush Your Teeth!